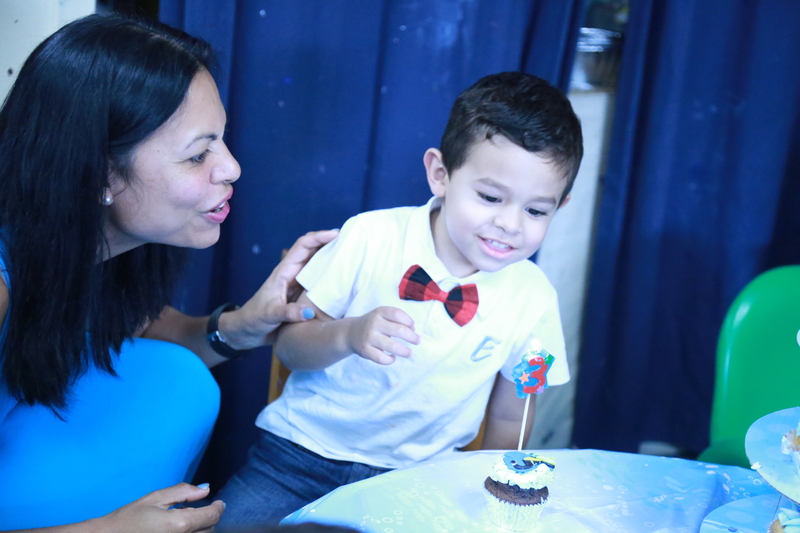 A few weeks ago, Cristian celebrated his third birthday—how did that happen. I still remember clicking my infant son’s car seat into its base so gently you’d thought I was handling a carton of eggs. Time passed and we’ve grown as parents. We don’t have it all figured out, but we aren’t tiptoeing into his room to see if he’s breathing anymore. The Difference Between A Fake Cry And A Tantrum – It takes time to figure this one out, so let me educate you. Like its cousin, the tantrum, the fake cry is another one of those joyous ways toddlers communicate. If you can’t tell the difference, watch your child the next time he or she is freaking out at the cash register at Toys R Us or the supermarket checkout when you try taking away a toy or box of Fruit Loops. If your child is smiling, smirking, or checking if there’s an audience, it’s a fake cry. When fake cries are addressed quickly your adorable toddler soon returns to normal. Ignoring the fake cry runs the risk of the kind of full-fledged tantrum ensuring parents a trip to the drug store to stock up on condoms. Don’t move just one more picture. We’re Not Wrapping Him In Bubble Wrap – Esther and I approach playdates and playground days differently. We both want to wear him out but approach how we get there differently. Cristian is a super energetic toddler who is totally fearless when it comes to climbing things. He’s also clumsy, he gets that from me—sorry son. Wiping out, falling on his face, or crashing into things again and again is business as usual. He just smiles and continues playing before falling again. The difference is mom sees a trip to the emergency room, while I’ll laugh and take a few pictures before he gets up. Converting from Crib to Toddler Bed is Game Changer – I miss the days when Cristian slept in a crib. It’s not me being sentimental—it’s purely practical—cribs form natural barriers. Once upon a time putting Cristian to bed was as simple as putting him down with a stuffed animal and a bottle and he was sleeping within 20 minutes. After his second birthday, he became adventurous, staking out his bedroom they way convicts plan prison breaks. Then one morning, we were awakened by the sound of little feet running across his bedroom floor. Before long he was climbing in and out of his crib like a ninja, forcing us to convert the crib to a toddler bed and changing his bedtime dynamic for the three of us. More than once Esther or I have fallen asleep on the bedroom floor keeping Cristian in his crib-less environment. 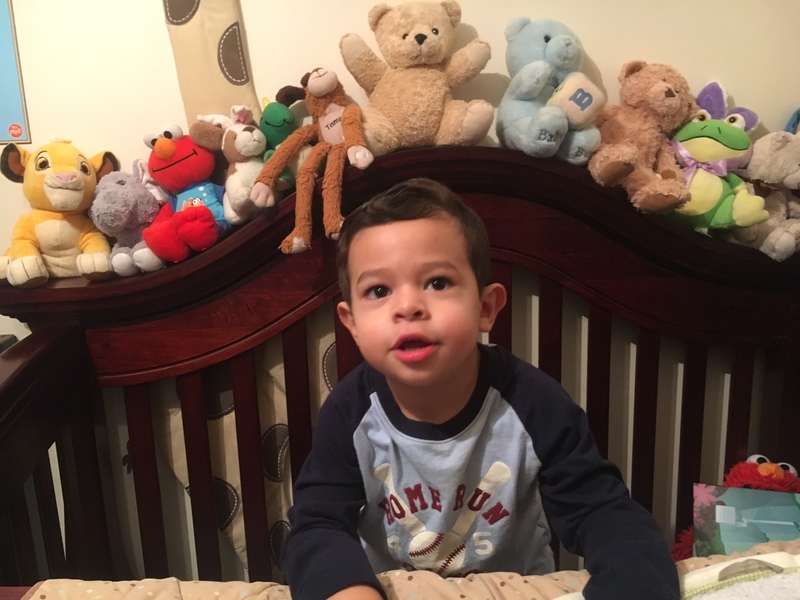 Cristian and his stuffed animals in his crib planning their next break. Find Your Tupperware Party – Growing up in the early 70s Tupperware parties were all the rage among the neighborhood moms. Becoming a parent some forty-years later, I have a fresh perspective on what they were about—a chance to socialize. Sure a few plastic containers were purchased here and there. That was secondary to emptying a few bottles of semi-fancy wine they couldn’t pronounce with the other moms while the kids were at school. DIY projects were the dad’s equivalent of the Tupperware Party. Many of my friend’s dads spent countless hours planning and replanning projects around the house. Translation, hiding in the garage with a six pack and hidden stash of nuddie magazines. A new kitchen counter was eventually installed but the time away from their whiny kids was priceless. Esther isn’t a big drinker and I’m all thumbs with power tools so we’ve had to find our own equivilent. On Sunday mornings, I’ll distract Cristian with breakfast and cartoons while Esther sneaks out for a morning run. (See the section on fake cries and tantrums if you are wondering why she’s sneaks out for her run). Later in the day, she takes over giving me some quiet time to write or go to the gym. It’s all about maintaing one’s sanity. Couple Time is Important – We’ve come a long way since our first date night as parents. Esther’s sister watched the baby giving us a Valentine-ish date a few months after Cristian was born. It was just dinner and a movie, but we didn’t make it that far. When the movie ended, we went straight to the drive-through window, instead of a local restaurant, calling for my sister-in-law and nephew’s order before heading home. 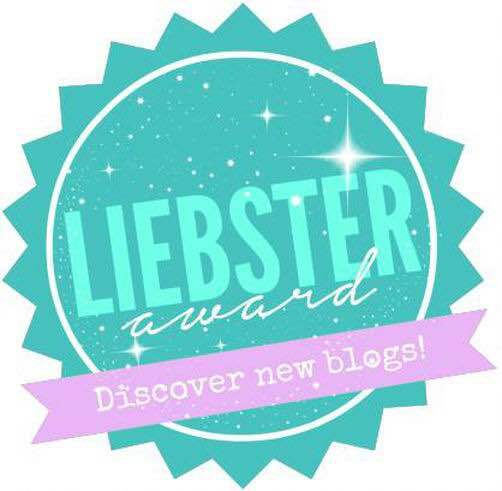 At first, we were over protective but finding reliable babysitters remains a challenge. Lately we’ve gotten lucky, a friend or relative offering to watch our little guy giving us a chance to go out to dinner and not talk about preschool, daycare or developmental milestones. Some Friends Will Disappear – Learning this one was rough. Everything starts out great when you’re new parents and the little one has the new baby smell. Slowly things change. Friends slowly disappear, not all of them, but patterns develop. You hear things like, “we need to get together more often,” but they are never available when you try making plans. They’re always “busy” or “things are always crazy at work.” Then you see them out and about in numerous Facebook posts. Felipe the Goat and I after pounding down a few Patron shots. It’s A Kid’s Birthday Party Not A Coronation – I’m not a big fan of birthdays, I don’t make a big deal about mine, in fact only a few friends know the actual date—I prefer it that way. That said I’m not Ebenezer Scrooge when it comes to Cristian’s birthday. I believe a child’s birthday party should be simple and about the child. Places like Chuck E. Cheese and Funtopia where kids run, play and have a slice of bad pizza and a piece of birthday cake are all you need. The guest list should be simple, parents, godparents, aunts and uncles actual aunts and uncles not the family friend claiming aunt or uncle rights and significant others, maybe a friend or two and their kids. That’s all you need. Isn’t it? Silly me. My better half believes it takes a village to raise a child. I just didn’t think it meant inviting the entire village. Guests arriving at this year’s party reminded me of clowns spilling out that little car at the circus. It wasn’t just family, it was friends, neighbors and their pet goat Felipe. “Just because the barista at Starbucks puts a perfect foam on your latte doesn’t mean you have to invite her to Cristian’s party. 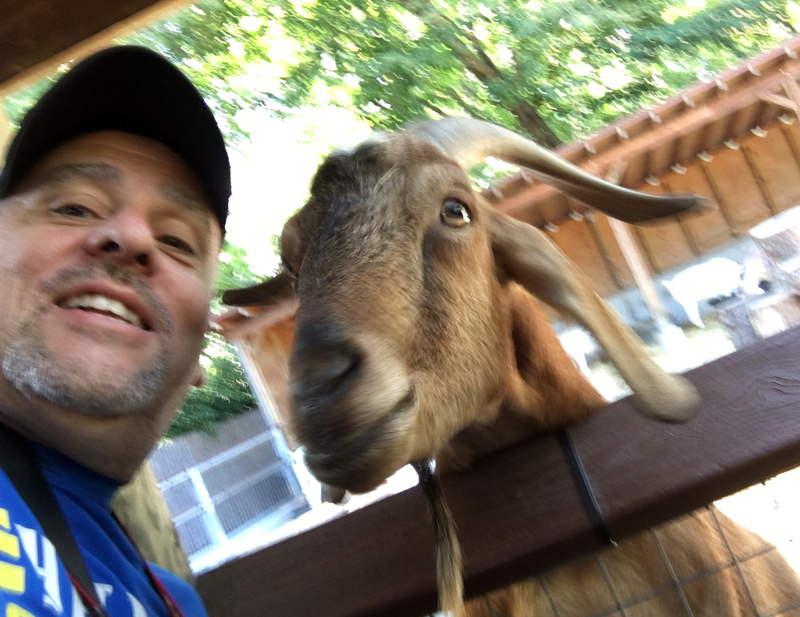 One positive note was Felipe the Goat and I had a great time. We pounded Coronas down chased with chilled Patron shots. ← When Did I Become My Parents? Thank you Tina! It’s amazing how much he’s changed. Couple time and babysitting remains a challenge, it may be a future blog post. Thanks for the shout out! Keep up the great work at Dad 2.0!